An American Art Deco platinum and 14 karat gold, sapphire and rock crystal dress set by Krementz & Co. 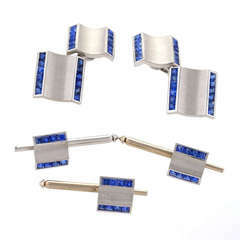 The dress set consists of a pair of double sided rectangular cuff links set with center french-cut sapphires and 4 square dress studs made of platinum framed Art Deco carved rock crystal and center french-cut sapphires. The set contains 8 bezel set french-cut sapphires with an approximate total weight of 1 carat. Circa 1920's. Signed, "Krementz " makers mark. 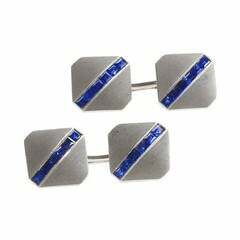 Dimensions: Cuff links: 1/2" length x 1/4" width; dress studs: 3/8" square.